Mary Lou's last day at OLPC is December 31. She will be continuing to consult with us on a number of different fronts as she chases after her next miracle in display technology. Mary Lou was OLPC employee Number One, both in terms of when she joined the organization and in terms of the breadth and depth of her contributions. Thank you and best of luck with your adventures in a new role and new year. Mary Lou was more that an employee, she was the foundation of OLPC. She designed the dual mode screen that made the XO laptop possible. 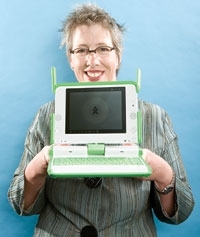 And Mary Lou Jepsen is Number One to me for more than her technical contributions to OLPC. She also kept the program real, skipping the grandiose statements for getting things done. She delivered us clock-stopping hot technology without pretense. She just delivered. From all of us who care about OLPC, may we deliver you the best wishes for you and yours in 2008 and beyond. Seconded --- Mary Lou, you're as top-notch as a person can be !! Thank you, Mary Lou! The XO is already having a big impact in a lot of ways! Good luck with everything in the future! No question XO's hybrid display is a true achievement. Good luck Mary Lou ! Satisfied that XO laptops were shipping in volume, Jepsen noted in an e-mail that she was starting a for-profit company to commercialize some of the technologies she invented at OLPC. Thanks Mary Lou for creating a truly innovative laptop. The XO-1 laptop succeeds because it does things no other computer can do. Thank you for all your efforts. At first I was worried that this was bad news. But after seeing that she is starting a for-profit company to do more of the same great tech work, I am much relieved. Win-win business can be every bit as effective as non-profit organizations for improving the world. Hats off to Mary Lou, Queen of Engines*! One could say, without too much of a stretch, that the XO is her display with a laptop built around it. This is not to minimize the work done in bringing the rest of the design to manufacturability, but to maximize the importance of her unique contribution. In not only designing the display but in bringing the whole design through the development process into manufacture, she joins the ranks of those about whom Steve Jobs says, "real artists ship". Real artists not only ship, but have to deal with patrons who try to marginalize them while grasping for unearned credit. Now that Nick's grand plan has fizzled and XOs are getting out into the hands of developers who don't accept all those plan's assumptions it is Mary Lou who emerges as the real mover and shaker (contracted, perhaps to maker"). I wholeheartedly endorse her decision to move into the for-profit sector of business. I made a similar decision a few years ago, observing that in the business world success breeds increased support, while in that of non-profits success yields a reduction in support. You can't argue with performance, and a working design takes on a life of its own. I will be doing my bit to try to apply it in ways I think will work, and everyone else ought to try as well. Has anyone else seen the slashdot.org headline that says she'l leaving to commercialize her olpc patents and that G1G1 was 'halted'? That is some sloppy e-journalism on slashdot's part IMHO. To MARY LOU JEPSEN ---- URGENT. Mary Lou:-- You can design and build hardware of various kinds, and intend to set forth and do so. They might even include e-book reading devices. Yes? I can put illustrated books in colour into incredibly small files for use on small, incredibly cheap, low-powered (even solar powered) e-book reading devices. If we get together, you and I, we can without doubt lay the foundations for, and even create, billions (no fooling) of dollars in a technological industry which is barely off the ground yet, and a lot of those billions can go towards saving the children of the undeveloped world. Would you like to send me an email, Mary Lou? Or perhaps reply to me here? A "spin-out" from OLPC, the company, Pixel Qi(http://www.pixelqi.com/) is looking to create a $75 laptop and trying to advance low-cost computers and power-efficient laptops, mobile phones and other consumer electronics that are sunlight readable, Jepsen wrote on the company's Web site. A similar promise to introduce a low-cost laptop came from OLPC, when it launched the $100 XO laptop in 2005. Since then, the effort has been afflicted by production delays and rising costs, which caused the laptop's estimated price to rise to $200. It is now beset by waning orders and competition from commercial vendors that threaten to sideline the nonprofit effort.